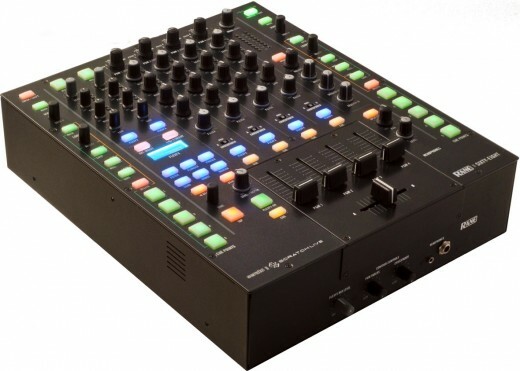 The Rane Sixty-Eight mixer has the added bonus of 2 separate USB ports making DJ changeover much easier. This "how to" is intended to guide you through the process so that you can change over seamlessly and there are no tears and unhappy ravers on the big night! When connected to the Sixty-Eight above each virtual deck there will be a USB channel select drop down box. 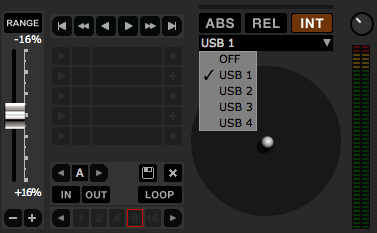 Use this to select which channel on the mixer the deck will output to. It's important that you familiarise yourself with these as they are the key to a seamless DJ changeover. The drop-down menu allows you to select your output channel. - The previous DJ has their computer connected to a USB port on the Sixty-Eight. Their left virtual deck is assigned to USB 1 and their right virtual deck is assigned to USB 2. - Connect your computer to the spare USB port on the Sixty-Eight. - Politely ask the previous DJ to free up the channel that is not playing. To do this, they must select OFF in the USB channel select drop down box. - Assign the virtual deck you wish to use to mix in your first track to the channel that has just been freed up. - Mix your track in and fade out the other channel. You are now in control of the music playing. - The previous DJ can now un-assign the other channel. Once this is done, they can disconnect their computer and leave. - Now assign your other deck to the last channel that has been freed up. - You have successfully switched over! Note: If you are intending on using the Rane Sixty-Eight in the club make sure you are running Scratch Live 2.0.1 or higher. If you are on a Windows machine you will also need to make sure you have the correct drivers installed. There is more information on updating drivers here.